It is also important to note that children are always welcome. Before outlining what the ILC support group experience is, we should address what it is not. First, this is not a meeting where we air grievances against the government, the medical community, other Lyme groups, or other patients. While blowing off that steam might make the person doing it feel good temporarily, this kind of venting tends to create a negative atmosphere for everyone else – which is detrimental to healing. Instead, ILC strives to create a safe place where people can ask questions, learn information, celebrate all victories (no matter how small), and leave feeling encouraged. Also, the ILC support group meeting is not a forum for promoting a particular treatment protocol. As an organization, we recognize that every single person is in a different place – with differing views, symptoms, genetics, and treatment protocols. And, as such, we do not endorse a specific treatment protocol as a “one-size-fits-all” path to remission, because the complexity of Lyme Borreliosis makes that impossible. Instead, ILC support groups are venues for bringing up possibilities that could help either the newly diagnosed, or that long-suffering patient who has hit a plateau. We want everyone to come away from an ILC support group meeting feeling a sense of community and belonging. Because of the controversial nature of the disease, Lyme patients and their families already live their lives with a feeling of isolation from the rest of the world. One primary purpose of our support group meeting is to let them know that they are not alone, and connect them with others who can, at least, begin to understand what they are going through. Another primary purpose of the support group meeting is to help patients and their caregivers and family members digest the daunting data and life changes that come with a Lyme diagnosis. This intention is most readily illustrated in the Pick Two Strategy that we often employ in our support meetings. The idea is to look at the list of all of the changes a patient needs to make or information he or she needs to understand, and pick two things to tackle. This approach breaks the tasks that make up the healing process down to more manageable pieces, and will help the patient to avoid feeling overwhelmed by the treatment journey ahead. The final purpose of the support group meeting is to educate patients, their caregivers and family members, and any other attendees about some aspect of the disease, or strategies for dealing with the stumbling blocks Lyme can present along the path to healing. We attempt to accomplish this purpose by presenting new research, as well as inviting guest speakers in to offer insight and strategies on a variety of Lyme-related topics – including nutrition and recovery after remission. To get an idea of the sorts of content and guests you can expect in our support group meetings, take a look at our list of past events below. Thanks to medical nutritionist Jodi Smith for sharing about foods with high nutritional value which also help with detoxification! ILC families are grateful to have her on our team. Recipes available upon request. at Indiana Lyme Connect’s support group. Have a favorite GF, DF, peanut free, low sugar recipe? Bring a food sample and 20 copies of the recipe. 1 attendee will receive $25 off their first appointment with Jodi Smith. Infected tissue can’t heal. But after Lyme disease is beaten down, there is hope. Health can return. Anyone who has experienced chronic Lyme disease and its associated infections can attest to the devastating emotional, cognitive, muscular/skeletal, and organ damage caused by Lyme. After years of treatment, everyone needs hope that the body can heal. ILC is responding to the many requests for testimonies of therapies that have helped individuals address cognitive dysfunction, nerve/soft tissue damage, vision and hearing sensitivity, and emotional trauma. Saturday (in the video): explore various therapies that have helped many former Lyme patients get back their life. This is part one of a three part series with local practitioners addressing visual/cognitive rehabilitation as well as regenerative nerve/soft tissue injury treatments. Saturday will also be helpful to those on the front end of their Lyme journey. All welcome. April 8th, 2017: Meet and Greet. Come for fellowship with others walking this road of Lyme disease. Bring your questions. By request, bring your cost saving tips and resources for medication, supplements, and food. Location back to the Hussey-Mayfield Memorial Library. November 12, 1:30-3:00. 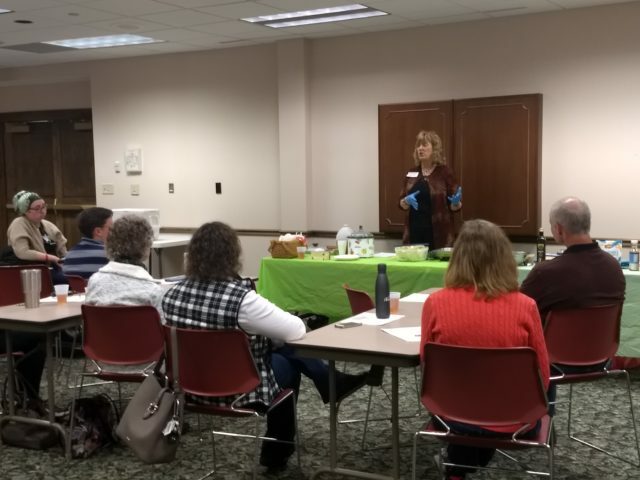 Indiana Lyme Connect presents our version of “Chopped” with Jodi Smith*, a Lyme literate nutritionist, sought after nutritional/chef consultant, and former radio host of Jodi’s Corner. Join us for cooking demonstrations, food samples, and tips for cooking and baking GF, Diary Free, and sugar free. And yes, ILC will present Jodi a surprise basket with familiar GF, DF, SF products. Come away with “Lyme legal”/family friendly recipes for the holidays! We welcome your ideas as well- bring a food sample along with copies of recipes. Children will be involved as well! Meet and Greet. Come with your questions. 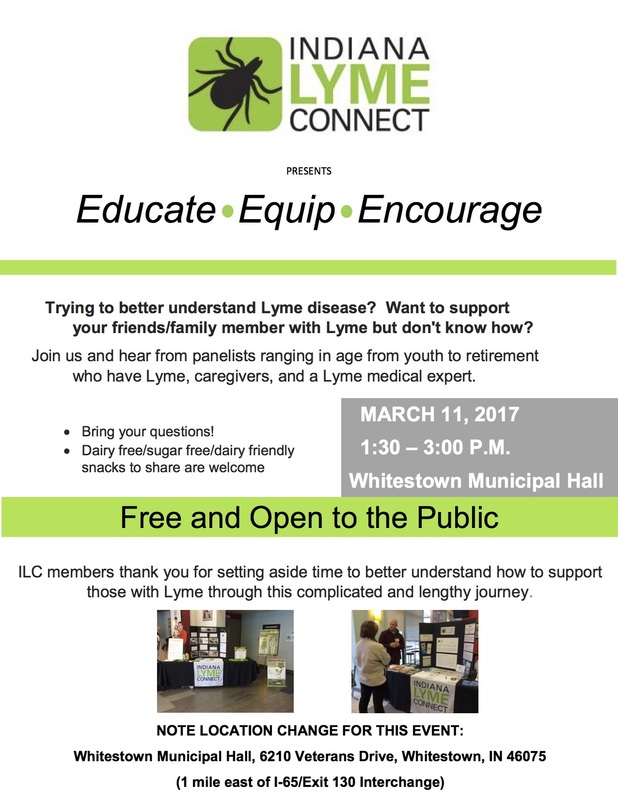 Come meet others who are on the other-side of Lyme treatment Come and be understood and encouraged. August 13th- 1:30-3:00 Meet and Greet. Discussion on the stages of treatment to wholeness. Looking forward to meeting you! June 4th 1:30-3:30.– Lyme Awareness Event. Free showing of Emergence. Do you know how to properly remove a tick? Do you know what to do if you are bitten by a tick? Do you know how to identify a tick? Do you know how to prevent ticks in your yard, clothes, and pets? Come on June 4th to answer these questions. Hands-on demonstrations for children and adults. Lyme disease is in Indiana so you are at risk. Preventing tick bites is the best defense against Lyme disease. Come and learn more on how to protect yourself, your pets, and your outdoor living spaces. Pamphlets. Demonstrations. In addition, ILC will be showing Emergence, Part II -a 60 minute documentary on the devastating effects and surrounding controversies of Lyme disease. The film will be shown from 2:00-3:00. Bring your friends, colleagues, neighbors, and family. Lyme is the epidemic of our time. May 14th – Print News Articles that Relate Personally with Your Symptoms, Publicity and Other Reasons. This meeting will also be an informal meet and greet with the opportunity to ask questions regarding treatment of Lyme disease with other seasoned Lyme warriors. I will send a reminder early to mid-week next in the week for printed articles and those that provide significance to you. Anyone walking the road of Lyme disease knows full well the financial hardship. Bring your cost saving tips and resources for medication, supplements, food, etc . NOTE: A handout of cost saving hints and ideas generated at the March meeting is available by request. Copies are available at the Indianapolis support meetings as well. As February is Valentine’s, it is a perfect month to honor and encourage our Lyme caregivers. Don Bartemus, Pastor of Compassion Ministries at College Park Church, personally knows many with Lyme disease. He will share helps and hope in walking the road of chronic illness. In addition, he wants to hear from you the caregiver and the patient to better understand this unique walk so that he can better serve the needs of families suffering from Lyme disease. Invite your close friends and family members who have expressed interest to better understand how to support you. Caregivers will go home with a special treat as well. Don Bartemus is the Pastor of Compassion Ministries at College Park Church. He and his wife, Cheryl, have been in ministry since 1987. Don believes Compassion Ministries exist to respond to the physical needs of people in order to participate in the fulfillment of the purpose of God in their lives. Don came to faith in Christ at the age of five through a Christian family. He attended Cedarville University, received a B.A. in Bible. He attended Grace Seminary and earned a M.Div. in Biblical Studies and later a Doctorate of Ministries from Grace Seminary. They have been in youth ministry, teaching ministries, and pastoring in the states of Iowa, Ohio and Indiana. Don and Cheryl have three grown children: Joshua, Tim and Debra. Jodi Smith has been a practicing nutritionist for the past 35 years. She is the author of “A Gift of Health” and the video series “Steps to Better Health”. Jodi was the chef/nutritionist for the television show “Mastering your Health” and has appeared on numerous television shows and radio programs locally, as well as nationally. Jodi hosted “Jodi’s Cupboard” heard on WBRI and WXIR for 25 years and was seen on WHMB TV 40 on her show “Steps to Better Health”. Jodi is the former Food Editor of the Saturday Evening Post, and was the Nutritionist for Mr. D’s Food Markets for 13 years. She teaches numerous cooking classes and has helped manage and create menus at health conscious restaurants. Jodi has a large private practice, providing nutritional advice and dietary modification; with many of her patients referred by MD’s and other practitioners from around the country. She also serves as the nutritional consultant for the Wellness Community (a cancer support system) and Georgetown Market, a local health food and wellness store in Indianapolis. Mrs. Smith is a sought after seminar presenter and has been a guest speaker for numerous groups including Butler University School of Pharmacy, International Organization of Pharmacists, The American Academy of Chiropractic, Indianapolis School of Nursing, PSI Corporation, CircleK Corporation, RCI, American Autism Foundation, Purdue University, and Indiana University. She has also taught at many local churches and special interest groups around the community. She served for 15 years on the Crook Foundation with Dr. William Crook, MD. She has contributed to numerous local and national publications. At your request, ILC’s Indianapolis support group is now meeting the SECOND Saturday of each month and with a new time of 1:30-3:00. So, please join us in Zionsville on October 10 from 1:30-3:00 for a very special presentation on Surviving Lyme with Dr. Lisa Miller. Dr. Miller, who is an internal medicine practitioner, is the newest Indianapolis physician now diagnosing Lyme Borreliosis Complex. This event will be recorded and shared at the Bloomington Support Group on October 17 at the Monroe County Public Library.